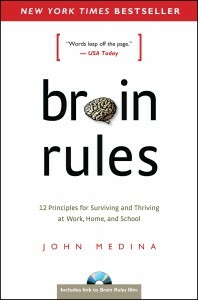 Below are the 12 Brain Rules developed by John Medina. Each link will take you to his site and to more information about each of the rules. You can find the original list in his book “Brain Rules” and on his Brain Rules website. SURVIVAL | Rule #2: The human brain evolved, too. WIRING | Rule #3: Every brain is wired differently. ATTENTION | Rule #4: We don’t pay attention to boring things. SHORT-TERM MEMORY | Rule #5: Repeat to remember. LONG-TERM MEMORY | Rule #6: Remember to repeat. SLEEP | Rule #7: Sleep well, think well. STRESS | Rule #8: Stressed brains don’t learn the same way. SENSORY INTEGRATION | Rule #9: Stimulate more of the senses. VISION | Rule #10: Vision trumps all other senses. GENDER | Rule #11: Male and female brains are different. EXPLORATION | Rule #12: We are powerful and natural explorers. Below is a guest post by Kevin Washburn, Ed.D., author of “Architecture of Learning” and Executive Director of Clerestory Learning. His most recent recording at a Learning and Brain Conference can be found here. It seems like a ridiculous question: Can a teacher’s words influence student learning? Of course, we’d respond, how well a teacher explains new ideas naturally influences student learning. But what about the words that are less planned, the comments teachers make in response to students’ ideas, efforts, and results? Can they make much of a difference? Research suggests they can and do, probably to degrees we’d be surprised to discover. Words reinforce beliefs, and beliefs, especially those about intelligence, influence learning. Students can hold or lean toward either believing intelligence is something you’re born with (or without), or intelligence is something you gain through effort. A student who believes you’re born smart—or not—is less likely to put forth effort to learn. This student seeks to convince those around him that he is one of the chosen who were given the gift of smart at birth. Either that, or the student may believe he is not among the chosen so effort is futile. The same belief interpreted differently yields the same result: a student who is unlikely to work to learn when learning does not come instantly or easily. This mostly erroneous belief can be slippery. A student may believe it is true in one discipline but not another. For example, the same student can believe that you are/aren’t born smart in mathematics, but that you get better at reading through effort. Where do these beliefs originate? Many times in the home. We’ve probably all heard a student say something like, “My dad said that I’m probably not good at math because when he was my age, he wasn’t good at math either.” The father’s words conveyed, confirmed, and/or introduced the wrong belief. When adopted by the child, the erroneous belief becomes an obstacle to learning. However, communicating the wrong idea about intelligence is not usually so overt. In fact, it can show up in a statement intended to encourage learning: “Wow, Sam, you’re really good at math.” Such a statement emphasizes a belief that intelligence is something you are/aren’t born with because it suggests innate ability rather than drawing attention to the effort-result relationship. “Wow, Sam, you worked hard on this and look at these results!” is better because it reinforces the idea that we get smart through effort. Just how much of a difference can this make? 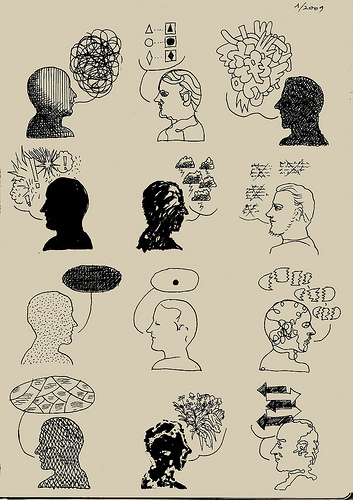 The results reveal the power of words that suggest both the right and the wrong beliefs. Students praised for innate ability put forth less effort, avoided challenge and feedback, and lost 20% of their achievement between pre- and post-testing. Not only did they not learn much, they seemed to lose ⅕ of what they knew prior to instruction. Through disappointment, we gain an opportunity to literally rewire neuronal connections, to learn, but only if we attend to our mistake. The student who believes intelligence is genetic loses this opportunity because he generally refuses to attend to his mistakes. Our words can influence the belief students hold about intelligence, and that belief influences the effort students apply to learning. We need to pause and think, “How can I phrase this feedback so that it emphasizes an effort-result relationship?” Our students may have to wait a moment for our comments, but what they receive may actually make them better learners. A wise writer once warned that words can be so destructive they burn down entire forests. But fire can also ignite rockets. Let’s intentionally use our words to ignite learning. Mangels, J. A., Motivating Minds: How Student Beliefs Impact Learning and Academic Achievement. Presented at Learning and the Brain: Using Brain Research to Enhance Cognitive Abilities and Achievement (Nov. 2007). Lehrer, J., How We Decide (Boston: Houghton Mifflin, 2009), 53-54. 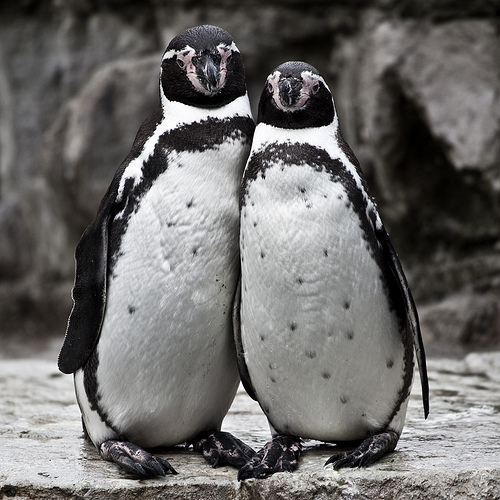 This post was originally published at Ecology of Education. Seeing the forest despite the trees. Our nation’s educational focus continues to zero in on “achievement” as defined by test scores in specific academic areas and the resulting gaps therein. This hyper focus exacerbates our nearly systematic blind eye related to learning for living and cultivating life long learners. As a result, policies that increase the stakes of standardized assessments necessitate schools increase the amount of time spent on basic skills — reading and math, primarily — to the exclusion of a broad range of other skills, experiences, and competencies. In effect, we see a couple of trees, but miss the forest, or big picture ecology, of learning. However, research suggests there are programs that have the dual benefits of both raising achievement and increasing student well being. It is in this realm where we learn to think about education in terms of the forest, despite our hyper focus on the trees. Social Emotional Learning (SEL) is such an example. CASEL (Collaborative For Academic, Social, and Emotional Learning) is the leading organization working to build demand and capacity for SEL. Their work ranges from network building to conducting research to policy advocacy. 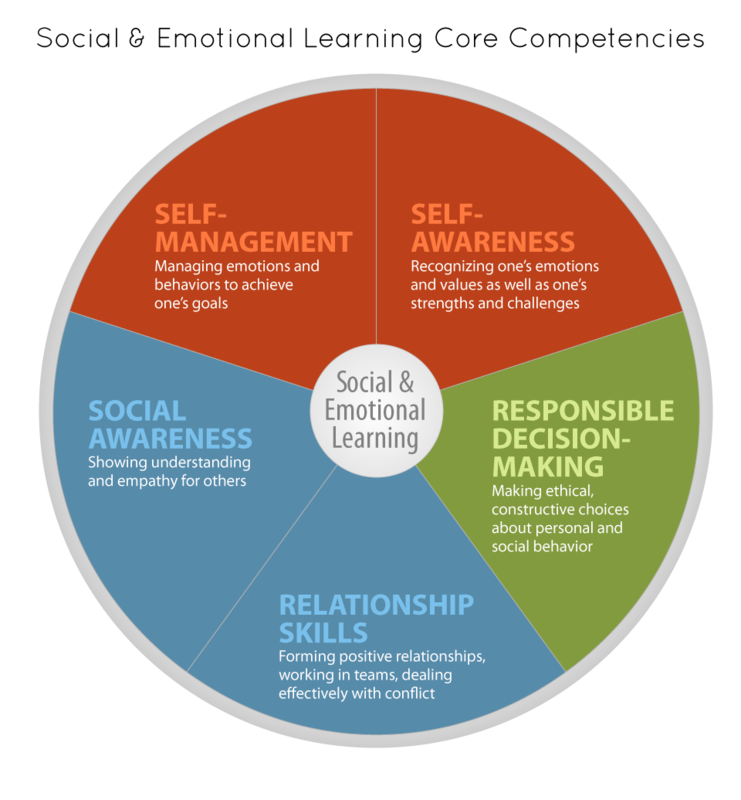 Below is a graphic (source here) illustrating what they define as the core competencies for SEL. Are effective in both school and after-school settings and for students with and without behavioral and emotional problems. Are effective for racially and ethnically diverse students from urban, rural, and suburban settings across the K-12 grade range. Improve students’ social-emotional skills, attitudes about self and others, connection to school, and positive social behavior; and reduce conduct problems and emotional distress. Improve students’ achievement test scores by 11 percentile points. Special thanks to Jackie Gerstein, whose post “Video Games and Social Emotional Learning” first pointed us to this chart. This is a part of an ongoing series exploring components of QED’s Transformational Learning Model. This piece relates to Academic Access, Curriculum Frame, Curriculum Goals, and Student Support. Love at first sight? Maybe. Check out (and be amazed by) the chemical / neurological reactions that happen (and the speed at which they occur) during the course of feeling lust and then moving to attraction and then attachment. This Scientific America‘s video, “Your Brain in Love and Lust” is a perfect one to share with a loved one, especially one you were attracted to during the first nanosecond of seeing them. 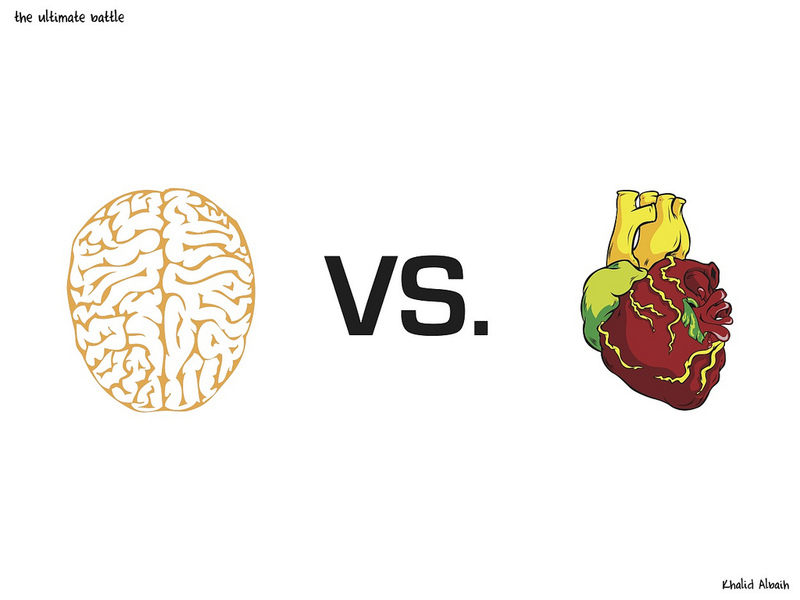 Your Brain — Valentine’s Edition. Anthropologist Helen Fisher studies gender differences and the evolution of human emotions. She’s best known as an expert on romantic love, and her beautifully penned books — including Anatomy of Love and Why We Love — lay bare the mysteries of our most treasured emotion. This exploration of the brain’s response to love will hopefully be a fun, nerdy, and educational way to think about your loved ones during this Valentine’s Day week. Enjoy. Want more on the brain in love?